Everytime I think of pancit, I always remember an office mate of mine who told a joke that concerns a popular motel chain and their good tasting pancit, using the pancit as cover for an amorous affair. Well, people who buy from this pancit chain need not worry that their lovers or husband came from some dubious place. Manosa’s is at the center of Makati’s Business district and far from the stretch of love motels, so you know it came from a clean and happy place. If I am in search for some chinese pancit, I always go to this pancitan for that warm bowl of noodles. Their restaurant reeks of soy and if you had left the store you’d probably be smelling like pancit. It’s simple but an enticing place to eat. Their specialties are of course pancit! 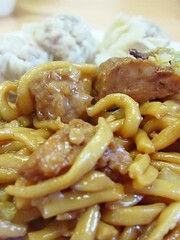 They have the usual chami, miki, miki bihon, lomi, lobihon, lomikibihon and the likes. Their pancit costs asround P120 but they can feed 3 people full! The last time I tasted pancit as good was this was from Binondo. Manosa uses Chinese ingredients and seasonings for the pancit that you feel like you ordered it fresh from Binondo or 168’s Food hall. They also have other chinese dishes such as siomai which are the largest I’ve seen (for that price at least). For 60 bucks I get 4 siomais that are as big as golf balls. They’re lovely, especially with chili garlic sauce. The Manosa experience brings the Binondo-esque pancit closer to the workplace. Finally, you don’t have to brave through Manila traffic just to eat good pancit. If you don’t want the dry Chowking experience or the costly North Park or Mann Hann pancits, then Manosa would be that perfect place to grab some noodle grub. Without us telling people like you to promote our restaurant, MANOSA PANCITERIA, we are flattered. Flaterring enough that so many guests clamor for bigger dining space. Hearing them, management decided to offer more cozy & spacious area to socialize with other satisfied patrons. Rest assured that we will continue to serve food isn’t just cooked, it is choreographed.to your satisfaction-gourmet salad, excellent noodles & pasta, incredible melt in your mouth Pastel de Lengua, Rice toppings, Dimsums & dumplings succulent baby back ribs,sushi & sashimi, crispy hito, steamed pla-pla, cakes & pastries, elegant Iced tea tower, and food to go. We also cater. requirements. Not only that, our price is very affordable as well. If you have acquaintances around Quezon City, please visit us at the Serenity Heights Bldg. Assorted dimsum & dumplings & wide array of cakes & pastries. We have function area to host your special gatherings. Please spare us your special day to visit us that will be on the house. GOD bless you & more power to you!!! Hey there punked noodle. Miss you friend 🙂 Manosa’s brings back a lot of memories while we were still in room 4 from way back. I was in Enterprise last week and was raving about Manosa’s where we plan to eat for lunch only to find out… it’s not there anymore!!! Hay… I hope they’ll have one in The Fort area. I used to be a patron of the Mañosa panciteria in Sta. Cruz … not because something bad happened to me after eating there but because I now live farther … but the Lomi is to die for! The original Panciteria Manosa is along Ongpin street in Binondo. If you think the Dela Rosa branch has great pancit and siomai you should go to the original restaurant. The Dela Rosa branch just DOES NOT COMPARE. The authenticity and flavor of the original will take you to a new gastronomic nirvana. I suggest you try the special Chami, the oyster cake, the Siomai (nearly the size of raquet balls) and the Maki. And if you thought Yang Chow fried rice is good, try the Manosa fried rice. It is also about 10% cheaper across the board.